Chokhor Duchen, also known as the Festival of Turning the Wheel of Dharma, commemorates the anniversary upon which Shakyamuni Buddha first began teaching the Dharma. For seven weeks after his enlightenment, the Buddha did not teach. After this period, Indra and Brahma offered a dharmachakra and a conch shell and requested Shakyamuni to teach. 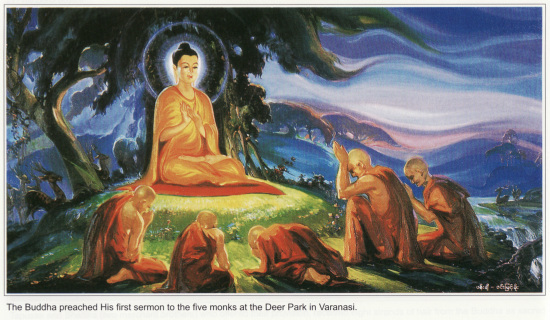 Accepting, Buddha Shakyamuni turned the Wheel of Dharma for the first time at Sarnath by teaching on the Four Noble Truths. Chokhor Duchen takes place this year on Thursday, July 31. As a Buddha Multiplying Day, karmic results of actions on this day are multiplied one hundred million times. This amazing result is sourced by Lama Zopa Rinpoche to the vinaya text Treasure of Quotations and Logic. You can find Lama Zopa Rinpoche’s recommended practices for this special day here (on Rinpoche’s Advice page, under Buddha Multiplying Days), and a calendar of all the holy days here. Chokhor Duchen also commemorates FPMT’s Twelfth International Sangha Day! If you choose to recite the Sutra of Golden Light on this special day, you might like to report your recitations using the facility on the FPMT website – which you can find on the Sutra of Golden Light reporting page. You can also find many other sutra texts available for free download on the FPMT Education Services’ Sutras page.